Data was prospectively collected and retrospectively analyzed on 22 patients undergoing laparoscopic conversion of VBG to Sleeve Gastrectomy over a 2 year period. Endpoints of the study include reasons for VBG failure, resolution of symptoms and complications. These operations were conducted by a single surgeon at a tertiary referral center. Twenty two patients, 21 female and 1 male underwent laparoscopic conversion of a VBG to SG. One operation was converted to open secondary to adhesions. Mean age was 46 years (range 30-63) with an average pre-operative BMI of 39.28. Presenting complaint was food intolerance in 68%, (15/22) weight regain in 40.9% (9/22) and persistent reflux in 40.9% (9/22) of patients. Pre-operative upper endoscopy demonstrated a proximal gastric outlet obstruction in 100% (22/22) of patients with band erosion occurring in 40.9% (9/22). Post operative complications included staple line leak in 4.5% (1/22) requiring re-operation, surgical site infection in 9% (2/22), post operative ileus in 4.5 % (1/22), and persistent post operative pain in 4.5% (1/22). Post operative stricture occurred in 18% (4/22) of patients with two requiring endoscopic dilation and two requiring re-operative surgery. There were no mortalities. Average length of stay was 5 days. There was dramatic improvement of presenting symptoms with 90% (20/22) resolution of nausea, vomiting and reflux. Average post op BMI decreased to 34.18 at 2.62 months. 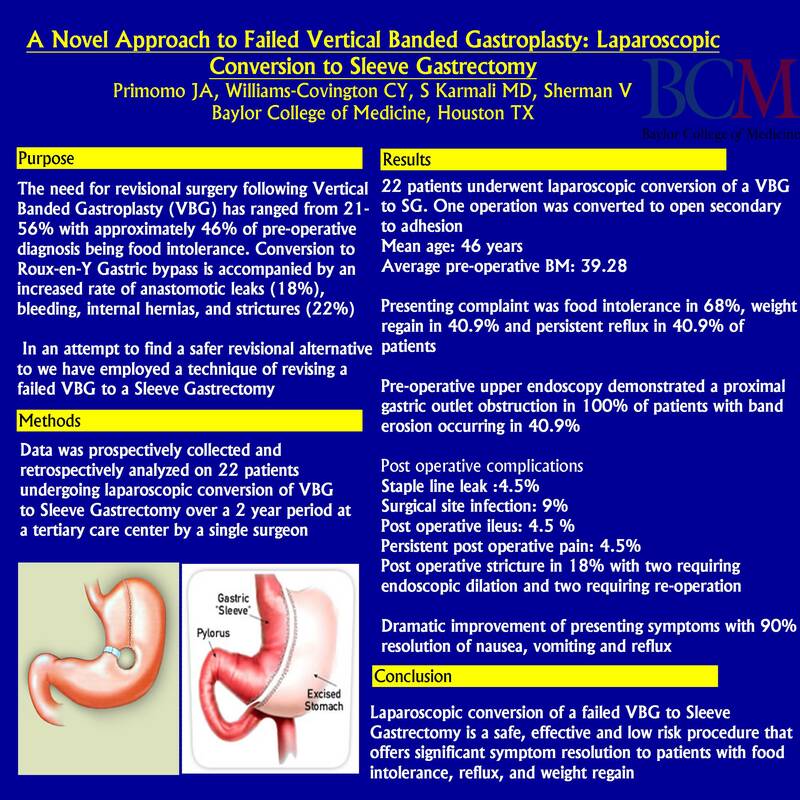 Laparoscopic conversion of a failed VBG to Sleeve Gastrectomy is a safe, effective and low risk procedure that offers significant symptom resolution to patients with food intolerance, reflux, and weight regain. This is the largest study in evaluating an alternative to the RYGB in addressing the late complications of VBG. Future comparison studies need to be conducted to compare the two procedures.